The AP Intermediate Advanced Supplementary valuation process has completed, AP Intermediate Second year advanced supplementary examination results to be released on 8th June, 2019 by 9.30 AM by Andhra Pradesh board Officials at Andhra Pradesh Board Office. These General and Vocational results of CD has been released by the MHRD minister Ganta Srinivas Rao, after the results announcement, the results are upload on its official website.Students can check their results from websites by entering Register Number and Date of Birth. 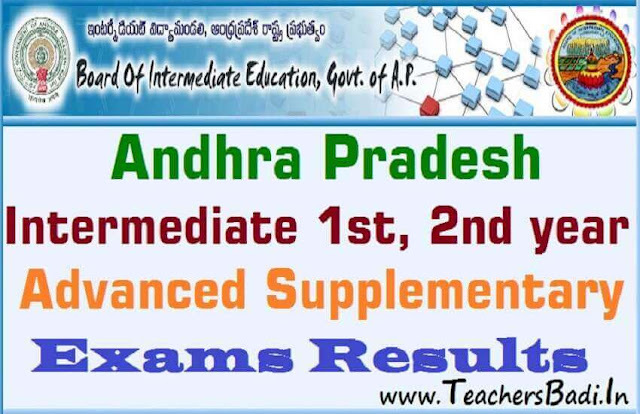 Andhra Pradesh Intermediate 1st Year and 2nd Year Supplementary results 2019 to be declared on June 8 bieap.gov.in/ AP Intermediate Supplementary result 2019: The results of the supplementary and improvement examination for Andhra Pradesh Intermediate 1st and 2nd year will be declared tomorrow. The Board of Intermediate Education Andhra Pradesh (BIEAP) had conducted the exam from May 15 till May 23, 2019. The supplementary and improvement examination is held for the students who failed to clear in one or more subjects or scored below 35 per cent. Andhra Pradesh Board of Intermediate Education (BIEAP) had released the results of the first and second year Intermediate Public Examinations results on April 16. This year, over 10 lakh students appeared for the Intermediate examinations. In both first and the second year, the girls have outperformed boys. While in first year, girls scored a pass percentage of 80 per cent, boys stood at 75 per cent. The practical examinations were held from May 23 to May 27. The ethics and women values examination was held on May 29 and environmental education examination on May 30. The students can download the results from the official websites – bieap.gov.in and bieap.cgg.gov.in.